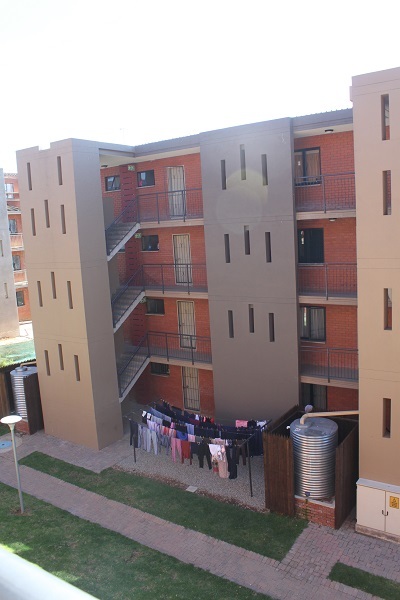 Chris Hani Village is a new social housing project in Germiston, Gauteng. The Chris Hani Village project is one of two that forms part of the city’s greater strategy of GEAR 2030 – focusing on urban renewal and urban regeneration of inner cities. 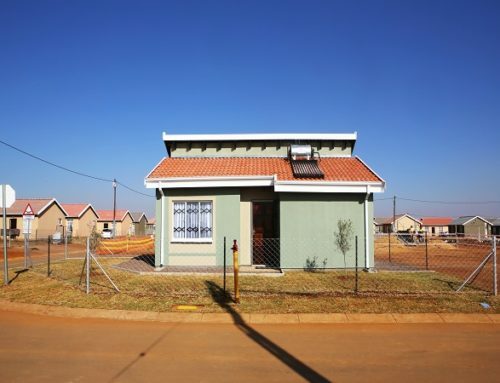 The project was a collaboration of various stakeholders including Ekurhuleni Housing Company (EHC), City of Ekurhuleni (COE), the Gauteng Provincial Human Settlements Department and the Social Housing Regulatory Authority (SHRA). The ward councillor and the community were also included in the development of the project. “With the project being a social housing project, we work very closely with the Social Housing Regulatory Authority — an institution that is responsible nationally to regulate the implementation of social housing,” explains Pheladi Mojapelo, EHC development manager. The SHRA provides funding for the implementation of such projects. The project was initially referred to as the Germiston Fire Station social housing project as it was located adjacent to the Germiston Fire Station. When the project was launched by MMC Human Settlements on behalf of Councillor Mzwandile Masina, Executive Mayor of Ekurhuleni in April 2017, it was renamed Chris Hani Village. The project was launched at a time that coincides with the commemoration of the late struggle icon’s legacy which is celebrated annually in Ekurhuleni during the month of April. The project started in November 2015 when the City of Ekurhuleni appointed contractors to start working on the project. The project was implemented in two phases, with 144 units delivered during Phase 1 and 200 units to be delivered as part of Phase 2 of the project. Phase one was completed in March 2017 and EHC commenced with the tenanting of the units, which are 98% full. Phase two involves the building of the remaining 200 units, including a crèche and commercial units. The commercial units consist of small shops that will be available for rental to people interested in leasing commercial space from EHC. Phase two of this project is yet to be completed and is currently at implementation stage. 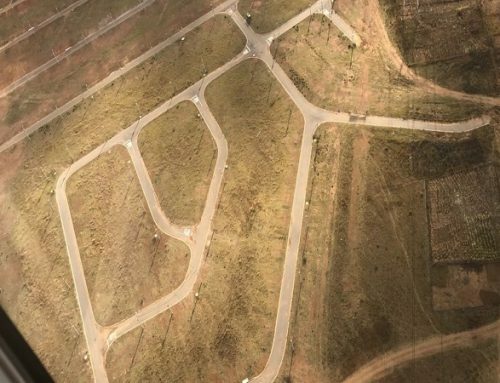 According to Mojapelo, phase two was expected to be completed by March 2018, however due to certain challenges experienced during the project completion date is revised to the end of May 2018. The initial budget for this project was R60-million (excluding VAT) and final cost is R62-million. 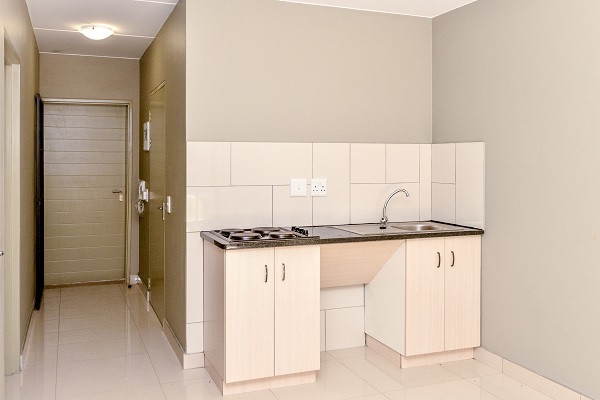 On average, the cost for individual units is between R380 000 to R400 000.
units is a bathroom, kitchen and living area. The exterior finishing of the units is a combination of face brick as well as plastering. The interior includes tile flooring, which was selected instead of carpets used in previous projects. 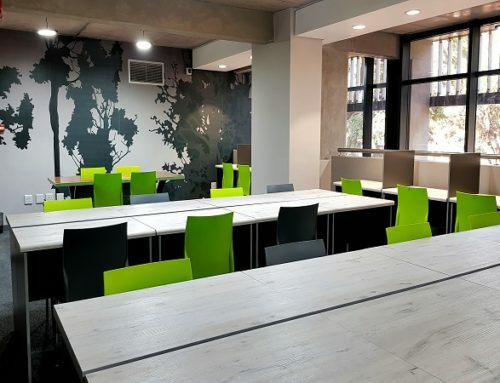 “With the development of the new projects, long term benefits with regards to issues of maintenance were considered in determining the finishes to be used in the project,” explains Mojapelo. The use of tiles instead of carpets for example, means long term saving on the replacement of carpets and cost savings on the maintenance. Aluminium windows, sliding doors and built-in stoves in the kitchen are also included in the units. 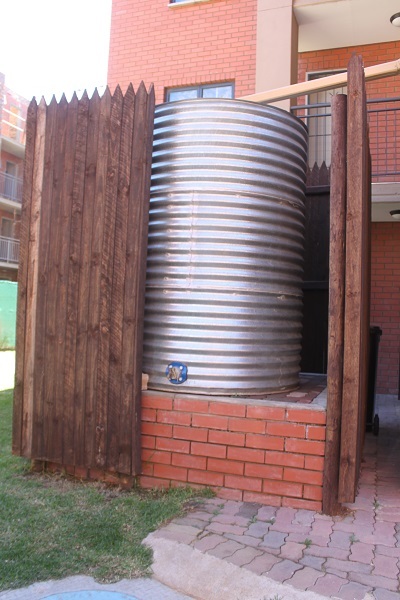 Some of the products used for this project include facebrick, aluminium windows, tiles, sliding doors, stoves and rain water harvesting tanks for irrigation. The units are designed to relieve long-term maintenance requirements and for this reason, the exterior of the units are a combination of grass and paving. All social housing projects must adhere to the minimum specifications as required by the SHRA. The most important issue for any development and for this project in particular is meeting the SANS 10400 regulation – governed by the National Home Builders Registration Council (NHBRC). Much emphasis is placed on the quality of construction, while also considering alternative building technologies and energy efficiency. Compliance and quality control is another issue to consider during this project. Building inspectors from NHBRC and the Gauteng Provincial Human Settlements Department conducted site visits on a regular basis to ensure compliance and quality assurance. “In Ekurhuleni social housing is regarded as a catalyst for urban renewal and urban regeneration within inner cities,” explains Mojapelo. She adds that Ekurhuleni is an amalgamation of nine towns, many of which have degenerated over time. To address this issue, the city has come up with the GEAR 2030 strategy – a plan focusing on urban renewal and urban regeneration of inner cities. Regarding this, social housing is a catalyst for the promotion of urban renewal and urban regeneration of inner cities. According to Morgan Pillay, EHC CEO, there is a whole thrust within Ekurhuleni to start looking within the inner city. Increasingly Ekurhuleni will start looking at inner city old buildings and to what extent these buildings can be converted for rental and social housing. “That’s going to be a big thrust for us going forward in the sector,” Pillay says. 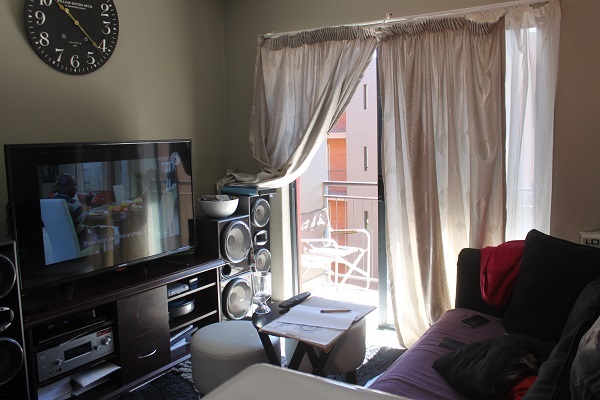 This project is perfectly located within the Germiston inner city, providing easy access and well located within reach of socio economic facilities such as the Germiston Fire Station. As part of promoting integration and identification within the city, the project is not only focused around the social housing units, but also the development of a new fire station. “In terms of the GEAR 2030, there are plans to integrate the fire station precinct to be a place that will epitomise integration where people can live, work and play within the Germiston inner city,” Mojapelo adds. Another unique aspect of the project is the look and feel of the units. “Those that live in these units are very fortunate people,” explains Pillay. A main focus of this project is to create units that are nice and liveable for people. Pillay adds that the type of finishes and the type of product created at Chris Hani made for a very superior product and says that it is probably the first and last time something like this can be achieved due to the cost limitations. As with any major project, challenges are to be expected and the Chris Hani Village project also had its fair share of challenges. “Just like any other construction project, we had some challenges regarding the fast tracking of payments in the project, which had a ripple effect. If the contractors are not paid on time then the workers are not paid on time,” explains Mojapelo. Community unrest from service providers, labourers and emerging contractors on site also proved to be another challenge. Most of the challenges were around payments not reaching labourers on time or as agreed. As a result, labourers were not willing to continue with work until such issues were resolved. “With the assistance of the COE, we were able to address those issues and we no longer have those challenges, the project is going smoothly,” explains Mojapelo. large portion of people that fall into the sector where they need to rent first because their income only allows them to rent. Once they can rent and build up some savings, and build up salaries over time after three, five or 10 years, only then can they buy and move up the housing ladder. As such rental and social housing plays an important step in people owning their own homes. Mojapelo refers to a study conducted by Demacon in 2015 which indicates that the need for social and rental housing in the City of Ekurhuleni is estimated at 60 000 social and rental units in the next 10 years. This amounts to 6 000 units to be delivered annually in Ekurhuleni – a clear indication that demand is rising. With such a high demand, Mojapelo explains that the city cannot deliver the capacity of the units alone adding that there is room for other private institutions to partake in social housing projects within the COE. The city has planned for upscaling social and rental housing projects that can be implemented in the short, medium and long term. Five short term projects have already been identified for implementation in 2018/2019 financial year. The projects are in various stages of planning, concept design and detail design, with one already at implementation with the appointment of a contractor. 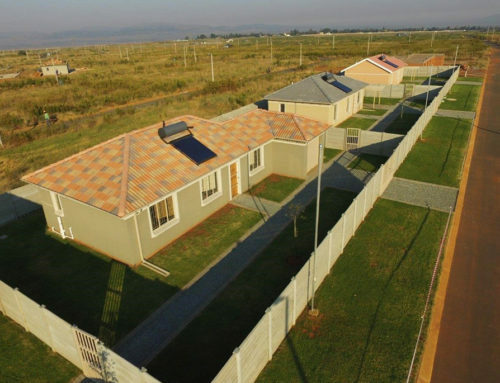 “There are many opportunities for social housing in the City of Ekurhuleni. The projects that we have spoken about are the first in the many that are to come,” Mojapelo says. In addition, Pillay says that the greater availability of social housing, will lead to communities passing through social rental housing as and when required. Ultimately people have adequate access to social and rental housing.